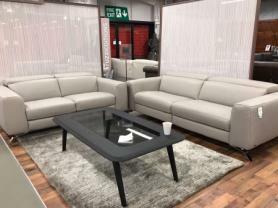 Thick Grey leather Penelope 3 seater sofa with large cuddle chair. The 3 seater is beautifully crafted with buttons backs and the swivel cuddle chair are extremly comfortable. The cuddle chair is a very good size so that you can fully stretch whilst you enjoy your moments in the swivel chair. The sofa also comes with pocket sprung seats which makes it more desireable with the chesterfield look but soft seats which are rarity on chesterfield sofas.